Hello Games has released the latest game in its popular Joe Danger series, Joe Danger Infinity. The game sees the franchise’s popular stuntman shrunk down to the size of a toy, racing through child-like environments full of wooden blocks, toy car loops and more. Each of the game’s 100 levels offers coins, stars and other objects to collect, with more than 20 new vehicles available for completing them. Each level in Joe Danger Infinity offers a different assortment of obstacles, like spikes to jump over or tunnels to duck through, and gives players a chance to perform stunts in the air by tapping on the screen. Players tap to cause their vehicle to jump and can tap and hold to duck, with acceleration handled by the game. To collect stars, gumball tokens and other collectibles, players must tap on them before speeding past them on the screen. Gumball tokens are used in a gumball machine at the end of each track, offering new characters, bonus coins and more as prizes. Some tracks are locked to specific vehicles or characters, so players may need to replay stages to earn enough coins to unlock the necessary costume or car. There are over 25 characters to unlock in all, with some offering bonus points to the player’s final level score. Players can compare their scores with friends on each stage, offering more incentive to replay levels to increase their high scores. 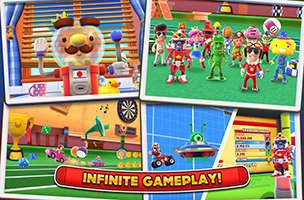 Joe Danger Infinity is now available to download on iOS for $2.99. The game is further monetized via the inclusion of coin packs for instantly boosting players’ bank accounts. Check back soon to follow the game on AppData, our tracking service for mobile and social apps and developers.